The first thing that strikes you about Bangkok is the bombardment of juxtaposing influences, Eastern and Western, traditional and modern, that hit you from all corners. Buddhist monks calmly walk past high rise buildings, ancient wats share space with beer bars and night clubs. Unlike other Asian cities like Tokyo, which resembles just another Western metropolis, the city of Bangkok seems comfortable enough with its multiple identities. Located only slightly above sea levels, Thailands largest city is flooded with monotonous regularity, during the monsoons and is, like so many other sprawling metros worldwide, chaotic, polluted and congested. Traffic is a nightmare, the temperature can reach record breaking levels, and there is a visible chasm that exists between the rich and the poor, but people here are much too busy having fun to notice or care. Bangkok was originally known as “Bang Makok”, and in its earlier incarnation was a small village situated on the banks of the Chao Phraya River. In 1782, King Rama I renamed the city as Krung Thep, as the locals still call it. This was the beginning of the Chakri dynasty of kings which continues to date. Krung Thep, like Los Angeles means “City of Angels”; foreigners however, still refer to the city by its older name. The city has had a tumultuous history, especially in recent decades as military dictatorships and coups took place regularly. However, it has escaped any long lasting damage from these events and, today, is one of the most exciting cities in the world. Economic liberalization has brought in Western ideas and influences, but the city which boasts of nearly 800 temples, still retains its spiritual identity and cultural heritage. The Suvaranabuhumi Airport has been Bangkoks international airport since 2006 and is used by all international flights. All facilities you would expect of a world class airport are available including money exchanges, ATMs, restaurants, a swank lounge and a duty free shopping arcade. Once at the terminal building, said to be the largest in the world, you can book a limousine at the limousine service center or catch one of the few metered taxis outside the exit. Airport express shuttles are also available and transport passengers to four stops – Silom, Khao San Road, Sukhumvit and Hua Lamphong Train Station. The flat rate is about 150 baht and they operate on an hourly basis. Local buses from a separate terminal connect the airport to many of the busiest areas in the city. Transportation isn’t really a problem in Bangkok. The Bangkok Sky Train, also known as BTS, plies much of downtown and costs 5 to 10 baht for a ticket. Rides on Bangkoks Metro cost about 12 to 36 baht depending on the distance you want to travel. The citys buses, operated by the Bangkok Mass Transit Authority, come in a bewildering range of colors and service innumerable routes. The newer, orange air conditioned buses are the most comfortable of the lot and charge a maximum of 22 baht. The small green buses are best avoided, cramped as they are and driven by lunatic drivers. Taxis are definitely a more comfortable way of getting around, even with the notorious traffic jams in the city. All are metered and air conditioned with a minimum fee of 35 baht. 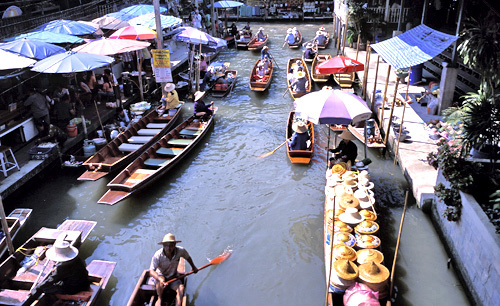 A trip around Bangkok will cost less than a 100 baht, with no surcharges. Avoid the yellow-green taxis. The meters are rigged and the service is questionable. The other colors are operated by the larger taxi service companies who enforce better quality standards. The Grand Palace is the most popular landmark in the city and home to the countrys most revered shrine, the Temple of the Emerald Buddha. Carved out of a single jade stone (not emerald, as most believe), the Emerald Buddha is an iconic figure in Thai culture and is placed high up above several altars. Besides, the shrine, there are other buildings and halls within the palace complex like the Borombinan Hall, and the Chakri Mahaprasat, which houses the ashes of the kings of the Chakri dynasty. Another palace worth visiting is the Vimanek Mansion, reportedly the largest golden teak building in the world. Within its 80 rooms and winding staircases lies an art connoisseurs dream – Thai and Western art, intricately caved teak and mahogany furniture, porcelain and glassware. There is also a museum with European carriages on display. If you have the time, take in a tour of the other palaces in the city like the Suan Pakkad Palace and the Phaya Thai Place. Palaces, being royal homes, a strict dress code applies for entry into one. Bangkoks dominant Buddhist tradition can be seen in the hundreds of temples, small and large, that dot the cityscape. Besides the Temple of the Emerald Buddha, the Temple of the Reclining Buddha, the largest wat in the city, is a regular on the tourist temple circuit. It’s famous for its massive figure of a reclining Buddha and as a center for the study of traditional Thai massage techniques. In fact, if you’ve never tried this incredibly rejuvenating therapy, this is a great place to be initiated into its pleasures. 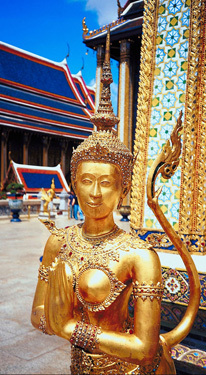 Make a sunset trip to the Temple of Dawn or Wat Arun- its illuminated façade stands out splendidly in the late evening. Wat Mahathat is a famous center for learning Vipasana meditation techniques. There is also a weekly amulet bazaar that’s set up just outside the palace. The 24 meter high Democracy monument is located at the center of a traffic roundabout and marks the establishment of the countrys Constitution. Another famous site is the Victory Monument, built to commemorate the martyrs of the Thai-Franco dispute.